The irresistible appeal of doughnuts can be summed up in this quote I found on the internet, I think: “Nothing tastes as good as skinny feels, except doughnuts; then skinny can go **** itself”. I can’t think of a single person who doesn’t love a doughnut, whether it’s a ring, filled, iced, or sugar-dusted version. There’s something deliciously naughty about sinking your teeth into one, and I personally love dabbing up that rogue bit of jam that always seems to fall onto my chin. 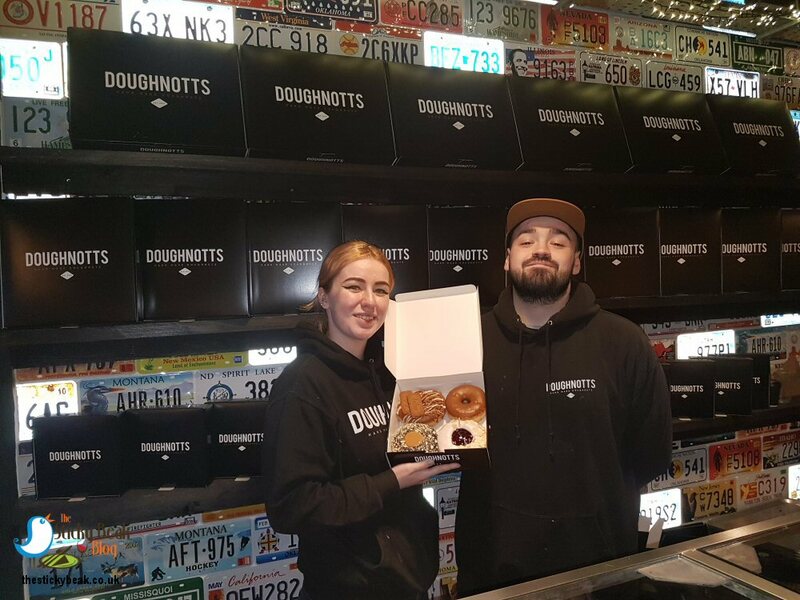 The lovely team at DoughNotts on Derby’s Sadler Gate randomly contacted us to ask if they could send us a box of their incredible morsels – heck to the yeah!!!! 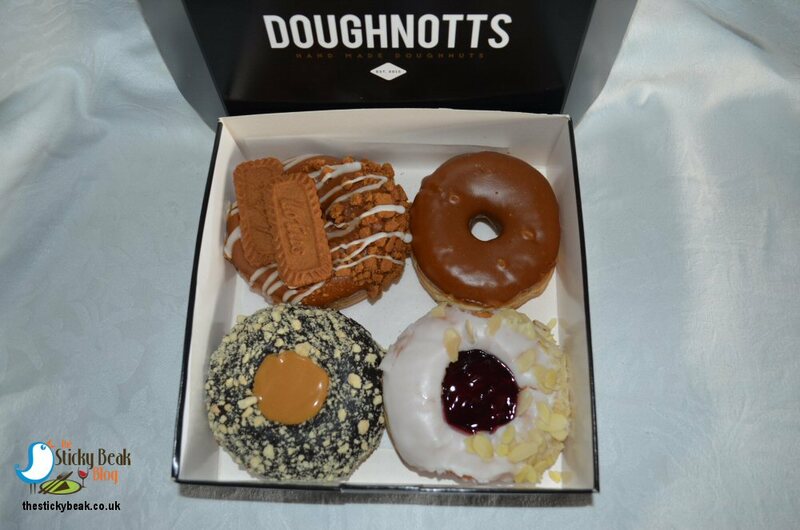 As you know, The Man Bird and I have sampled some of the various treats that DoughNotts has to offer when we went to their opening night; if you haven’t had them yourself, they are simply divine. 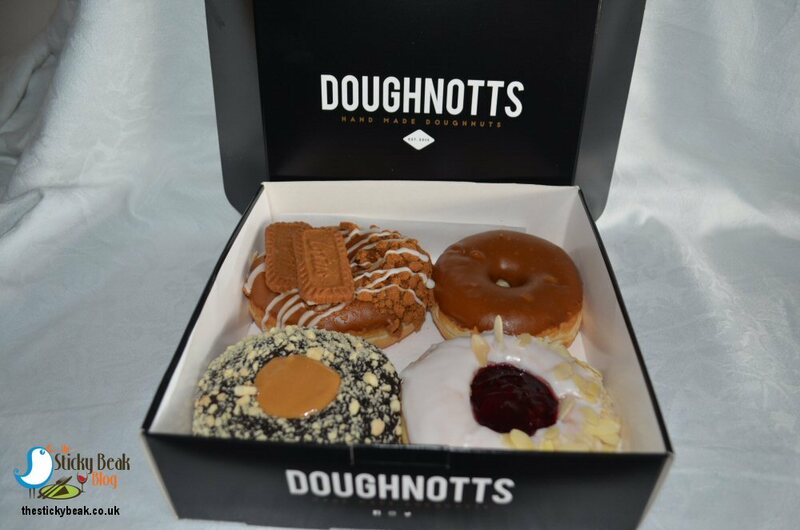 America can keep its Dunkin’ Donuts and its Krispy Kreme imitators; DoughNotts is where it’s at for doughnut aficionados. 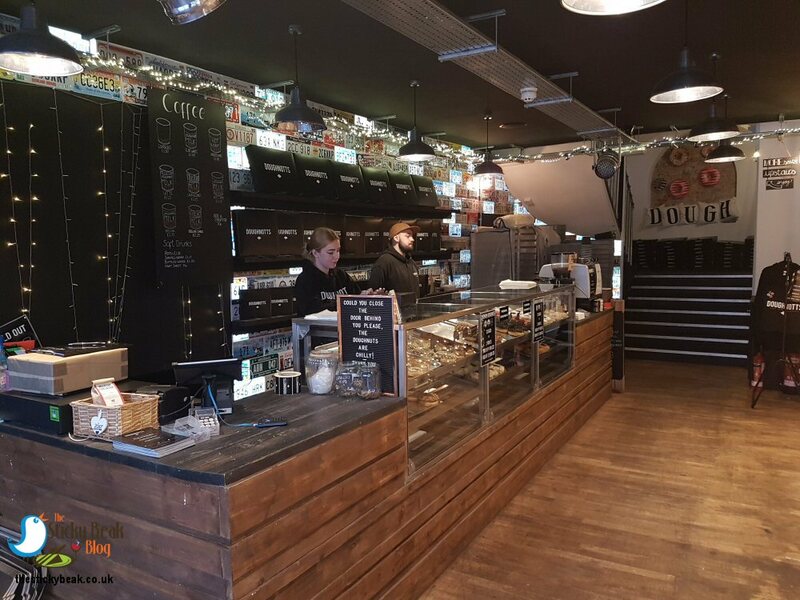 His Nibs was duly dispatched to go and collect a box made fresh that day – DoughNotts make their doughnuts fresh every day (with a sprinkle of extra care, attention and love I reckon! ), so I knew they were going to be scrummy. Back at the nest, I was all a –quiver with excitement and when The Man returned, I hastily opened the box to see what treats we’d got. Oh my days! We had Cherry Bakewell, Weekend Billionaire, Scoff It (all these 3 are from the premium range), and Salted Caramel (regular range) to choose from. Being a Derbyshire gal, it was a given that the Cherry Bakewell fella was going to be first down the hatch. Both of us took a big bite into the pillow soft doughnut, releasing the large crimson lake of Cherry filling. I loved this filling, it’s the same one you get in Cherry Pies; really fruity and with loads of the fruit in it. A coat of Vanilla Fudge icing surrounded this fruity centre, but suspended in its frosty confines was a sea of Almond slices that provided a lovely crunch when bitten into. This was a work of art in the doughnut world and a great alternative if you’re not in the mood for Chocolate (?! ); better still, it’s suitable for Vegans. Those with a hankering for a chocolate fix will go nuts for Weekend Billionaire; doughnut homage to Millionaire Shortbread. Again this is a complete indulgence, perfect in my mind to chase away “hump day” blues or herald the arrival of the weekend, in equal measure. The amply sized doughnut had a deep, generous filling of exceptionally rich, slightly smoky Salted Toffee that lingered in the mouth very satisfyingly. Partnering the indulgence of the Toffee was a wickedly rich dark Chocolate Fudge topping scattered with crumbly, buttery pieces of shortbread – get in!!. Despite its richness, you don’t have to be loaded to afford this minx. The third premium doughnut we tried was the Scoff It variety, named after the Biscoff biscuits that are evident throughout this beauty. Visually, this doughnut is a thing of beauty and I’m pleased to say that it tastes every bit as good as it looks. It really wasn’t possible for the DoughNotts team in Derby to have crammed any more into this specimen - and that’s before you factor in the duo of Biscoff biscuits perched on the top! The lovely thick doughnut had lashings of Salted Caramel on its top, interlaced with decorative drizzled lines of Vanilla Fudge. A multitude of Biscoff crumbs decorated the fondant and then two whole Biscoff biccies reclined regally over it all as a finishing touch. Again this is suitable for Vegans. Last up was a classic ring doughnut, the rascal that is the Salted Caramel variety. 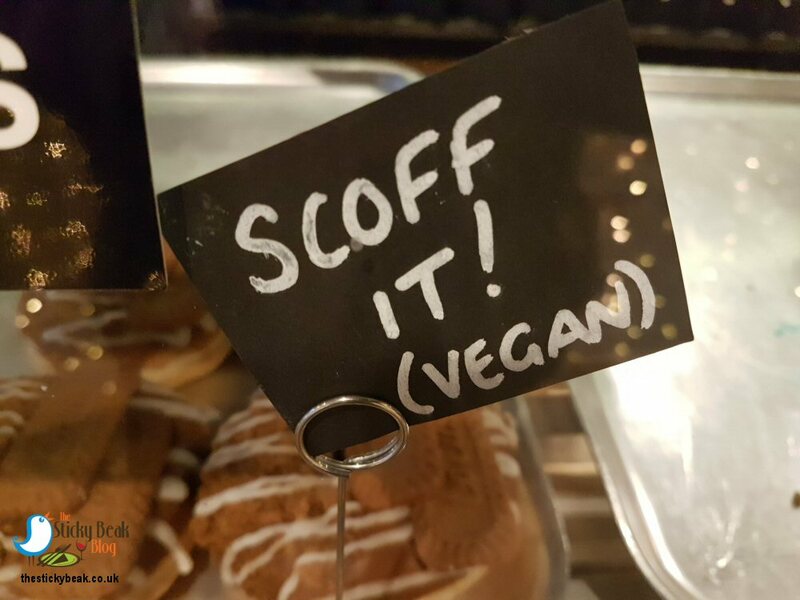 This also Vegan friendly and forms part of the regular range of doughnuts on offer at DoughNotts. As with the other doughnuts we’d sampled, it has a great texture, and although it only boasts a single topping -Salted Caramel - it most definitely isn’t a poor relation to the others! The depth of flavour in the Salted Caramel is just fantastic and it lingers delightfully on the tongue. I was surprised that, given its richness, it didn’t give me the tooth jitters, but no, no tingle at all. 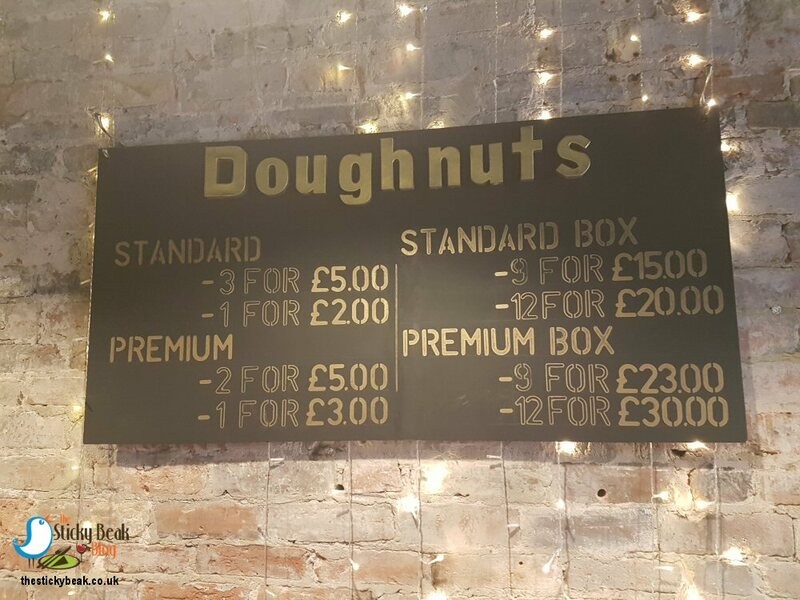 The prices for the doughnuts are as follows; premium doughnuts are £3 each or 2 for £5, standard/regular doughnuts are £2 each or 3 for £5. If you are celebrating an occasion or work in an office and fancy an office fuddle, the doughnuts are available in boxes of 9 or 12. Standard/regular doughnuts are 9 for £15 or 12 for £20 and their premium cousins are 9 for £23 or 12 for £30. Let’s face it, what price happiness (and brownie points too if you treat your colleagues and boss! )?